To discover the hidden secrets of Solid Edge there is an extensive library within Solid Mastermind of Solid Edge Tips & Tricks. The more experienced you become with Solid Edge the more you are looking for ways to improve your productivity. You want to complete tasks within Solid Edge in the most effective way. Whilst a structured training curriculum is suited to new users of Solid Edge, short focused video tutorials such as Solid Edge Tips & Tricks are ideal for experienced users. This library of Solid Edge Tips & Tricks called Solid Edge Top Tips is logically indexed so you can find the relevant tip quickly and easily. The Tips & Tricks are delivered using on-line video tutorials and are typically no more than three minutes in length. Shot in high definition video they can be viewed on a multitude of devices: computer, tablet, smart phone, and many other streaming media devices. You can view these tutorials wherever you have internet access. Solid Edge is an amazing piece of software, and to help you get the most from it these Top Tips are yet another essential resource for Solid Edge users. 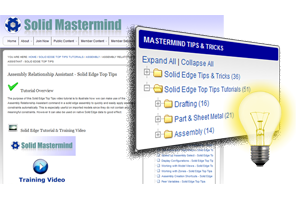 When you want to discover the most effective ways of using Solid Edge turn to the Solid Edge Top Tips within Solid Mastermind. "...Thanks again for your help! Your site is an incredible resource for me to fine tune my skills with Solid Edge. I will always refer to it and refer it to others also." "I just wanted to let you know that I'm extremely impressed by your training program! 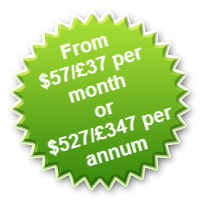 It's the best presentation and value of any on-line CAD training I've seen! Awesome job!!!" "...I was set-up to have access to the Solid Mastermind website and followed the training videos at work and home. I have found the website invaluable in the sense that the training videos show the capability of Solid Edge whilst allowing you to learn at your own pace. These videos and tips have built up my confidence to establish the basics and know what and how to do things that otherwise would have been difficult to achieve. Some of the new things learnt have already been shared with other more experienced users to make our jobs easier. I personally prefer the training videos over a classroom training course or other methods..."